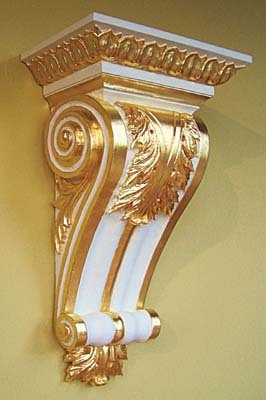 Carvers have been decorating their work with gold since ancient times. By applying a thin 'leaf' of metal to a carved surface, the reflected light focuses attention on the curves, swirls and angles of the pattern, where otherwise, the grain and figure of the wood may distract the eye. Nothing breathes life into a carving quite like the flash and glow of gold. 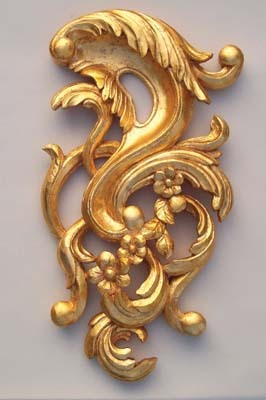 To give a carving a rich 'antique gold'finish, you don't need to be rich yourself or have any experience as a gilder. Just follow these cheap and simple amateur methods and with a little practice, you will have lovely, rich-looking pieces. 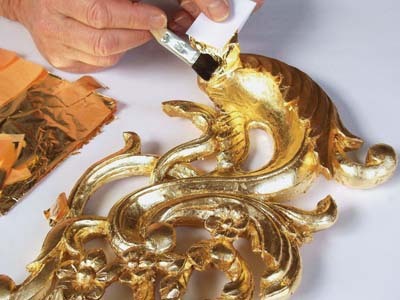 The cheapest and easiest way to gild a whole carving is by using imitation gold leaf - basically brass. It is sold at most art stores in books of 25 sheets for about Â£10 (US$15). Each sheet measures 140mm (5 1/2in) square, so a book can cover a lot of wood, even allowing for wastage. 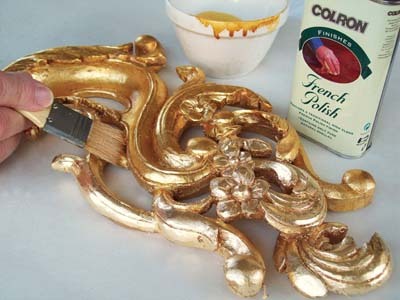 You will also need a good quality gold lacquer for use as an undercoat, some gilding size, and some French polish, which we will use as a sealer (see photo 1). This limewood Rococo swirl is a nice carving, but the dull matt colour of the wood doesn't really give us the true period feel (see photo 2). Through gilding, the reflected light from the golden metal will make it sparkle like a diamond! Start by sealing the wood with a suitable sealer (such as Danish oil) then coat the whole carving, front and back, with a good gold lacquer (see photo 3). Put it on thinly so you don't clog the detail, and leave it to dry thoroughly. 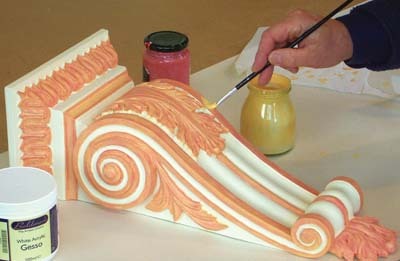 Apply some gilding size thinly to a section of the carving (see photo 4). Leave it for about 10 minutes until it is dry but slightly tacky to the touch. 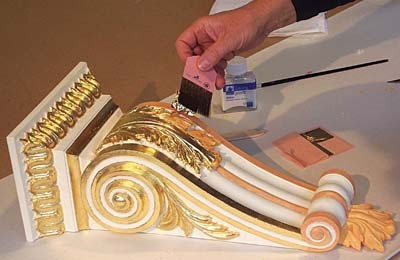 Only size an area you can comfortably gild in about 30 minutes, then progress over the carving, one section at a time. Take a sheet of gold leaf, still in its cover papers, and cut it into pieces about 50 x 25mm (2 x 1in) with scissors. The ideal size varies according to the features on your carving - it should fit over an individual feature like a leaf or flower - if it is too big, you will waste a lot. Fold a small piece of paper and use it to pick up a piece of leaf, then slowly and carefully - it is very thin and delicate - place it on the sized area. Press it down gently with a soft brush, and brush away any loose pieces of leaf (see photo 5). Don't worry about small gaps - the undercoat will disguise them - but go over larger gaps with more leaf. This is a bit tricky at first, but you will soon get the hang of it. Where the surface is concave, place the edge of the leaf in the hollow, and lay it up and over the adjoining ridge. If the leaf spans the hollow, it will just tear in the middle. Imitation gold leaf needs a sealer to stop it tarnishing. It also looks a bit 'brassy' so to 'antique' it and seal it at the same time, you can use French polish (a form of shellac). Apply the French polish thinly by brush, letting it settle a little in the crevices (see photo 6). Work quickly as it dries fast, and avoid going over the same bit twice, or you will build up a muddy looking patch. If it all goes horribly wrong, wipe it off with methylated spirit and start again. Some jobs are worth going the extra mile, and there is nothing quite like real gold for giving a carving an authentic period look. Pure gold leaf of 22 to 24 carats (I use 23 3/4 carat) is more expensive and a bit harder to handle than imitation gold leaf, but it gives a true gold finish that needs no sealer and will never tarnish. 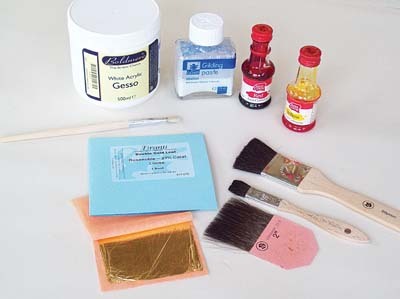 Although more expensive, it is not prohibitively so, especially when used as 'parcel gilding'. 'Parcel', in this context, is a corruption of 'partial' and refers to the practice of gilding parts of a carving as highlights, leaving the rest painted or French polished. Real gold leaf is much thinner than imitation gold, and the first time you try gilding with it, you will find it frustrating, but you will soon get the hang of it. Real gold leaf also comes in books of 25 sheets, but each sheet measures only 80mm (31/8in) square - a third of the area of an imitation leaf. Expect to pay about £18-£25 (US$27-$37) for a book, which you will need to get from a specialist supplier. 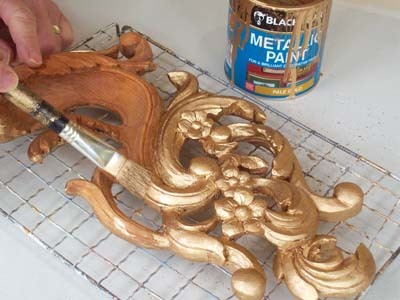 Real gold is best applied over several coats of gesso, which gives a smooth surface to the wood. Traditional 'rabbit skin glue and chalk' gesso is fiddly to use, so buy a tub of ready-mixed acrylic gesso from any art store. 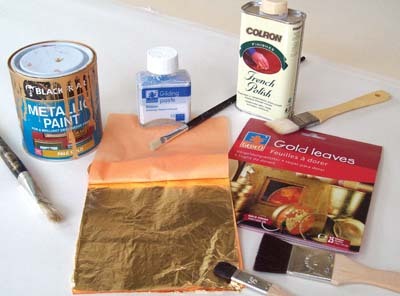 You will also need some gilding size, some red and yellow food colouring, a soft brush for pressing down the leaf, and a special 'gilders tip' (see photo 8). 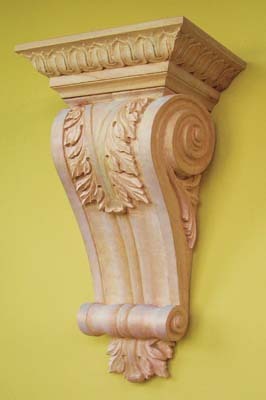 I'll demonstrate this technique with my Georgian corbel, featured in Woodcarving 104 (see photo 9). Seal the wood with Danish oil or sanding-sealer and give it two coats of a suitable heritage paint. Apply very thinly over the detail so you don't clog it with paint. Apply 6-9 coats of acrylic gesso over the areas to be gilded to build up a smooth surface for the gold leaf - take great care with accuracy. To make it easier to see where each coat is going, and to give a background colour to the gold leaf, add a little red food dye to the first coat of gesso, then yellow to subsequent coats (see photo 10). 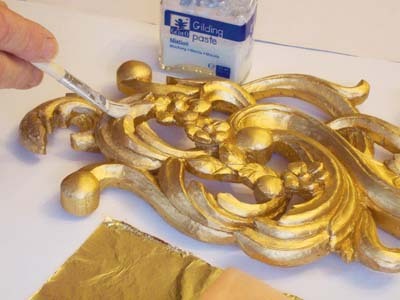 Apply a thin coat of size to the areas to be gilded, one section at a time. The gold will stick exactly where you put the size, so accuracy is important. The size takes about 10 minutes to become touch-dry. Carefully fold back the cover paper on a sheet of gold leaf (it is very delicate) and gently score across the leaf with a knife at the edge of your fold. Cut it into sections slightly larger than the patch you are going to gild. Pick it up slowly and carefully with a 'gilders tip' - rub it in your hair first to build up static - lower it carefully into position, and press it down gently with a soft brush (see photo 11). Brush away loose leaf from the edges and go over bare patches again with small pieces of leaf. 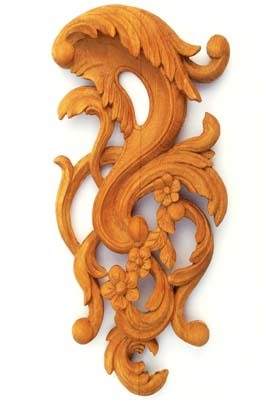 This carving (see photo 12) took about 40 leaves of 23 3/4 carat gold at a total cost of about Â£30 (US$45). It is much more expensive than imitation gold but as it will never tarnish, it will not need sealing and will retain its brightness for very many years. Happy gilding!